A major cyber attach could cost billions of dollars and, unlike extreme weather, comes without warning. The total cost of a worldwide cyberattack could be as high as $53 billion, according to a report issued by Lloyd’s of London in July 2017. That’s almost as much as the cost of Superstorm Sandy ($50-$70 billion), the second costliest disaster in U.S. history. But worldwide cyberattacks aren’t the only risk for small businesses. 43 percent of cyberattacks target small businesses, according to Small Business Trends. Cyber-attacks can come from anywhere: nation states, terrorists, criminals, activists, external opportunists and company insiders (both intentional and unintentional). Their motivation may be to gain political, military or economic advantage. Where businesses are concerned, though, they steal money or data they can turn into money, such as credit card numbers, health records, personal identification information and tax returns — or they set up a ransom situation that locks the company’s access to its data until the ransom is paid. 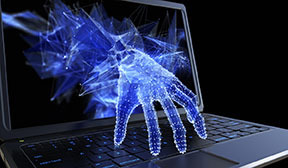 Identity theft as a result of security breaches where sensitive information is stolen by a hacker or inadvertently disclosed, including such data as Social Security numbers, credit card numbers, employee identification numbers, drivers’ license numbers, birth dates and PIN numbers. Make sure all company computers have the latest security software, web browsers and operating systems to protect against viruses, malware and other online threats. Turn on automatic software updates, if that’s an option. Many updates specifically address known security risks. Scan all new devices, including USB devices, before they are attached to the network. Use a firewall to keep criminals out and sensitive data in. Use spam filters. Spam can carry malicious software and phishing scams, some aimed directly at businesses. Know what Personally Identifiable Information (PII) you’re storing on your customers, including where you store it, how you use it, who can access it, and how you protect it. Delete any unneeded information. No matter what firewalls, software and authentication protocols you’ve installed, your cyber security system is vulnerable if you’re not educating your employees on avoiding risky behavior online. The Workplace Security Risk Calculator, available free at https://staysafeonline.org/stay-safe-online/resources/workplace-security-risk-calculator, lets your employees gauge the level of risk their online behaviors pose. You can get more good advice here: https://staysafeonline.org/business-safe-online/implement-a-cybersecurity-plan. Even with a cyber security plan in place, your business still needs a fail-safe to protect it against cyber risk. Currently most standard commercial lines policies do not provide insurance for cyber risks. You need a special cyber liability policy. Due to the lack of actuarial data, however, it’s difficult to price. Insurers deal with this by evaluating each risk according its risk management procedures and risk culture. As a result, cyber risk coverages are more customized and, therefore, more costly. The type and cost of cyber liability coverage offered by insurers is based on the type of business, its size and geographical scope, the number of customers it serves, its web presence, the type of data it collects and stores and other factors, including its risk management and disaster response plan. For more information about cyber security insurance, please contact us.